I love kale just about any way I can get it. Other than the obvious salads, I like it mixed in soups, stir frys, breakfast casseroles, or just cooked with carrots in a pressure cooker. However, I would have never thought of grilling some canned artichokes and putting them with some garlic sauteed kale. But that is what my latest edition of Cooking Light had in their table of contents and it sounded interesting. The original recipe includes directions for using fresh artichokes and I do plan to try that in my pressure cooker. However, this was a busy night and I had canned quarters on hand so I utilized those for this recipe. Grilled artichokes are fantastic! I had no idea what I was missing. Heat a grill pan over medium-high heat; coat pan with cooking spray. Combine 1 tablespoon oil, artichoke quarters, 1/4 teaspoon pepper, and 1/8 teaspoon salt in a medium bowl. Add artichokes to pan; cook 3 minutes on each side or until grill marks appear. Combine remaining pepper, salt, oil, 2 tablespoons lemon juice, shallots, and mustard in a medium bowl, stirring with a whisk. Heat a saute’ pan with 1 Tablespoon oil. Toss in kale and saute 1 minute. 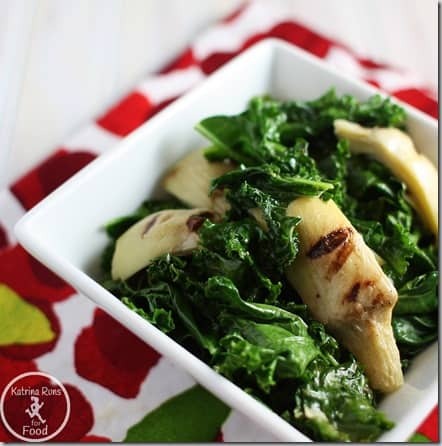 Pour mustard sauce over kale and quickly toss and coat. Add wine, being careful with steam. Turn off heat and continue tossing kale with sauce and wine for another minute. Plate immediately. Top with pine nuts. Previous Post: « One down, one to go!